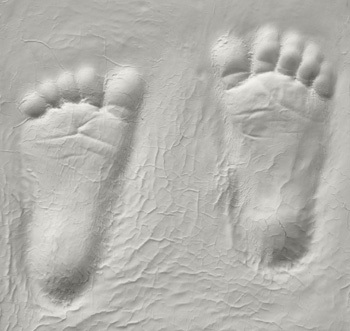 Preserve your baby’s tiny footprint forever with plaster! An hour and a half on the first day. 45 minutes to an hour on the second day. Press the modeling clay evenly into the bottom of the shoe box. The clay should be about 3 to 4 inches deep depending on how high you want the cast to be. Coat your baby’s foot with a light coating of the oil and press it deep into the modeling clay. You might want to do this while someone is helping support your baby so you can keep his foot still and get it the desired depth. Once the clay is around his foot the way you want it, gently pull it hand out. Be very careful to not move or gauge the clay. Then, mix 1/2 cup water to 1/4 cup plaster of paris together, slowly stirring the mixture until it’s thick, but pourable. Even though the clay will harden if left exposed to the air for too long, you don’t want to rush and whip the plaster. Stirring it too vigorously can cause bubbles which will be seen when the cast is completed and hardens. Pour the plaster of paris into the footprint depression in the clay and let harden completely for at least a day. The next day, peel of the paper from the box to expose the block. With a small hammer and a screw driver carefully tap around the block. Just go slowly to crack only the clay, not the plaster. Leave the plaster it’s natural white color or personalize it with your favorite color paint. To personalize the casting, trace his name, the date or a special message backward in the clay before pouring in the plaster of paris. Just remember to not only write the letters backwards, write right to left, instead of left to right so the message is legible when the cast is completed.